Let's be real, Halloween is the best holiday for every child (at least I hope). Candy, fun costumes, incredible decorations, candy, trick or treating, candy, and the novelty of it all. I used to always go trick or treating as a kid and I would have so much fun decorating the house and planning my costume. But what do you do when you're "too old" for Halloween anymore? Not that you can ever out-grow Halloween, but sometimes there are some aspects of how you previously spent Halloween that you just might need to modify. 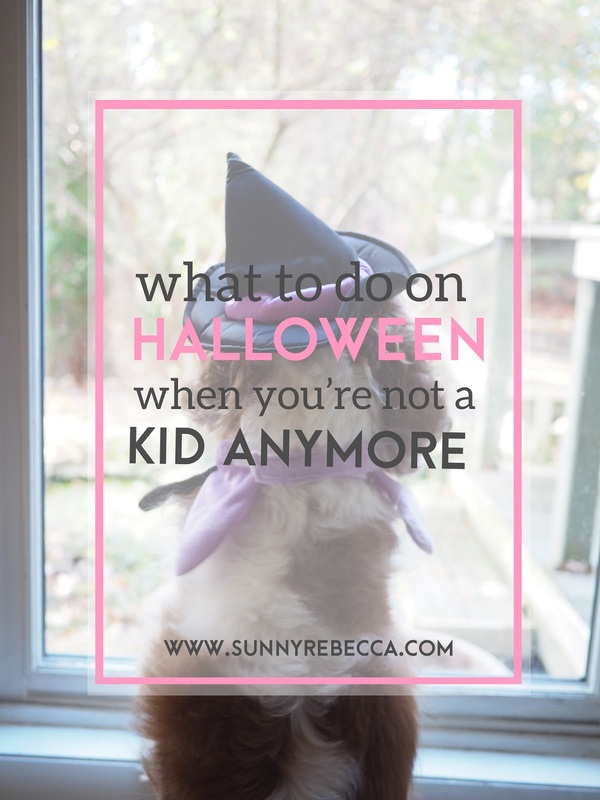 Because sometimes it feels a little strange, like you're too old to part-take in some Halloween festivities, but you're just not ready and/or to let go of the holiday. (Sound familiar? Check out the Peter Pan diaries - a series about the struggles of letting go of childhood) Not that trick or treating when you're older is a bad thing, trust me, free candy is always a perk of Halloween, but sometimes it's just time to change things up a bit so that you can still enjoy Halloween, but in a different way. Get your spook on, starting with a murder. Because what's Halloween without the talk of the dead? I had a murder mystery party for my birthday a few years ago and it was so much fun! Not only can you wear costumes to get into character, but it's a ton of fun trying to guess who the murderer is. It's essentially like clue, but much more interactive. Get a murder mystery kit, there are tons of themes and plot stories that you can pick from, and you can pick a spooky one to fit the festivity of Halloween. The kits come with everything you need for a great night, character descriptions, instructions, evidence and/or forensics reports, menu options (so that your food matches the theme) and costume ideas for you to really get into character. For my birthday party a few years ago I used the "Class of '54" murder mystery party kit, where the theme took place in the 50s in a class reunion. This murder mystery party kit is super cute and Halloween themed if you're looking for one, and this one looks interesting to me as well, about the gangs of Prohibition-era Chicago. Halloween treats are so much fun. I've been seeing them all over Pinterest and I want to try them all out. Invite some friends over and have a Halloween themed bake-off. Have everyone bake a sweet treat that is Halloween inspired, or break off into teams. May the best baker win! Currently swooning (and drooling) over these gingerbread skeletons (bonus tip: turn them into pumpkin gingerbread for even more Halloween fun), cookie dough mummies, and oreo eyeball truffles. It's a double whammy, you get the joy of making the treats and eating them. I personally love the decorating aspect, especially since they all have the Halloween theme. Plus, there's the adding bonus of spending time with friends, but you can always bake Halloween treats on your own if you're not spending the night with friends. Not a literal blood bath, but a nice warm bath with a red bath bomb. Of course you don't necessarily have to be limited to a red one, but using a red bath bomb will turn the water red like blood, right along with the festivity of Halloween. Lush also has some absolutely adorable Halloween bath bombs and bath melts and soaps that you can use to make bathtime more festive. Eat some candy while in the bath and just relax. This is the perfect thing to do if you don't have any Halloween plans. Just because you're at home doesn't mean that you can't still celebrate with a nice hot blood bath. I'm not sure if there is one everywhere, but check to see if there is a local event around you for a Halloween dog costume parade or something similar. There are lots of parades of dogs wearing adorable Halloween costumes, sometimes handmade if their owners are super committed, and it's so cute. If there's no parade around you, no problem! Host your own Halloween pet costume parade and invite all of your friends to bring their pets and have them dress them up. Make it even more fun and have a costume contest to see which pet has the cutest costume, to encourage your friends to go all out. When it's time for Halloween, it's not just you that needs a killer costume, but your furry friend as well! Okay, this one is kind of simple and straight to the point, but as a kid I didn't really carve pumpkins very often. However, now that I'm older, it's so much fun to carve them! You can use stencils or go freehand, but you can get creative with your design. It's easy and a great way to spend Halloween and get in the festive mood. A couple years ago I did a Snoopy design and it was SO cute. It's a great activity to do with friends or with your family, or even by yourself. It's a fun journey to carve a pumpkin and the end result is so satisfying. Go out among the trick or treaters and have a scavenger hunt. Before heading out, write a list of things that you need to find, like 5 kids dressed as Elsa, a Frankenstein carved pumpkin, a person handing out Cadbury Dairy Milk chocolate, a ton of random things that you need to find while you're either a) trick or treating or b) roaming around on the night of Halloween. Make up some specific things on the list that are a bit trickier to find. The person or group that finds the most of the things on the list gets a prize. It's a fun way to either change up trick or treating or just spend your evening. This way, you're still enjoying the festivities of Halloween and it adds that additional competitive edge to make the night even better.